The highlight of My New Backyard patio redecorating scheme has most definitely been this pallet daybed. I really wanted a place to sleep outside with my daughter, and a comfy couch to relax on with friends. I didn’t have the funds to invest in a fancy piece of outdoor furniture, and I knew that with the weather as it is in Los Angeles, I could leave this outside pretty much all summer. I also knew that I would, at some point, need to move it under the awning to keep it dry, so I put it on wheels. And finally, I knew I would need arms, because I’m just not comfy on a couch without arms. So here is the DIY Pallet Daybed I came up with. I built this myself, with no help at all, in just a few days. I’m a crafty person and comfortable with tools, but I’m not an advanced woodworker by any stretch of the imagination, and this project was simple enough for me, so I know you can do it if you want to. 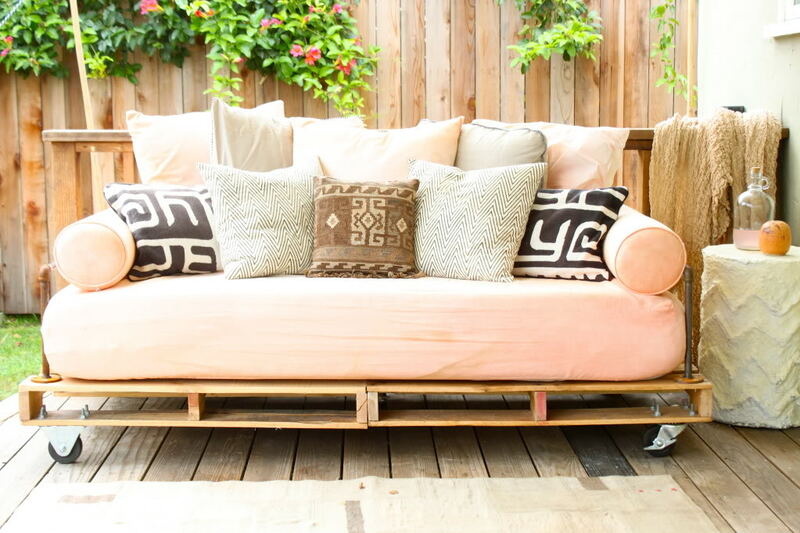 Let me show you how to make your own DIY Pallet Daybed after the jump. First let’s talk dimensions. A standard twin mattress is 39″ X 75″, but there’s a few inches difference between most mattresses, so pick your mattress first, then your pallets. Pallets come in many sizes, I used 48″X40″ which is fairly standard. I just went downtown to an area I like to call the “pallet district” where there’s tons of spots that sell pallets to any takers who drive up. If you google your city and pallets or look in the yellow pages, you will find the pallet distributors in your area. Most will only deliver large amounts, but are happy to have you drive in and purchase a few. Ask for the nicest, newest, least chemically-est pallets they have. These were the finest pallets I could come by, and they were $3 each. Next I stocked up on supplies. 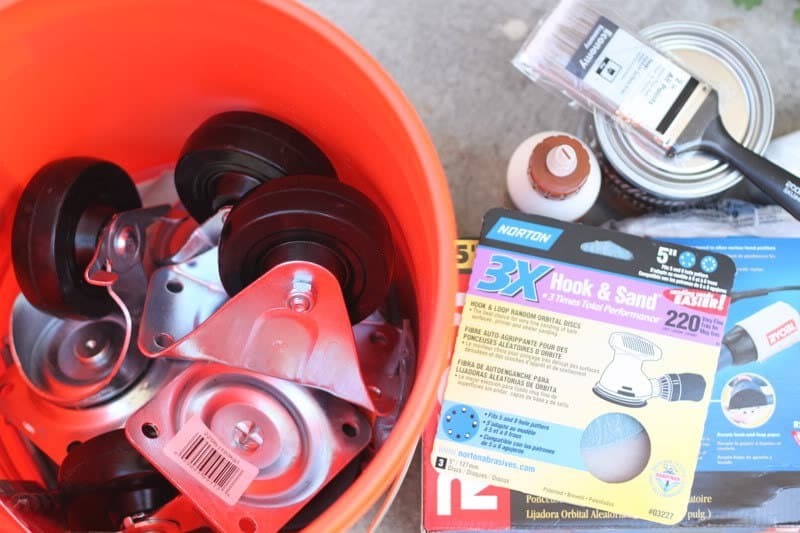 I used my Membership Rewards points to get a gift card to home depot, which I then used to buy 5 large (4″) casters (2 that don’t move at all, and three that swiveled with locks), some outdoor polyurethane and a brush, and sanding discs in 60, 180, and 220< grits. I also got myself a new orbital sander because I somehow managed to lose my first one. 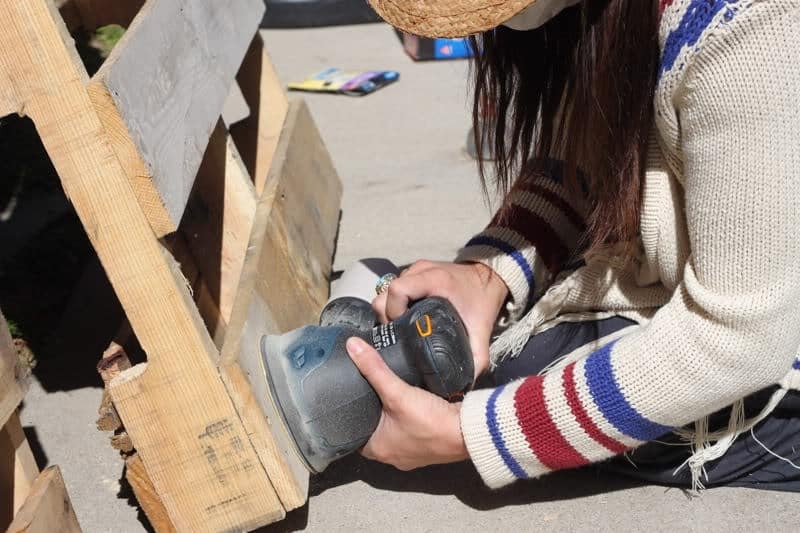 Sanding your pallets is really the most important part of this project, because no one wants to get splinters from their furniture. I don’t recommend doing this by hand, unless you realllllllllyyyyy love sanding. First things first, sand those pallets down. Start with the lowest grit (60) and move up. Make sure you wear eye protection and a mask to keep all that nasty dust and chemical treatments out of your lungs and eyes. Keep sanding for a long time, until you have a nice, smooth, splinter-free pallet. I also picked up a 3/4″ drill bit, and lots of 3/4″ bolts and nuts, and a pile of 3/4″ washers. I got three 3/4″ X 3″ bolts for attaching the two pallets together, and 20 3/4″ X 2″ bolts for attaching the casters to the pallets, and enough washers (23 minimum) and nuts to secure them all and account for any I might drop while working (no one wants to go back to the hardware store for one washer, so get extras). Now, originally I had planned to leave the pallets their current size and make a back for the couch out of a third pallet. So I didn’t cut the base pallets down to size at this point. But once I had it all assembled I realized that with a back it would be too deep for my deck, so then I had to go back, cut it down, and reattach the casters. So I advise you cut your pallets to size first. You’ll be attaching the sides with the wood frame, which on these (and most) pallets is the 48″ side. So you would have a base that is 48″ deep and 80″ long. So you would want to cut the 48″ side down to about 40″ to accommodate your twin size mattress, for a final bed base that is 40″X80″ (for a 39″X75″ twin mattress and room for the arms we will add later). But you’ll see that I did that backwards. So, now it is time to drill holes to attach the two pallets together. Carefully measure and mark three holes on each pallet, one close to the front, one close to the back, and one in the center. 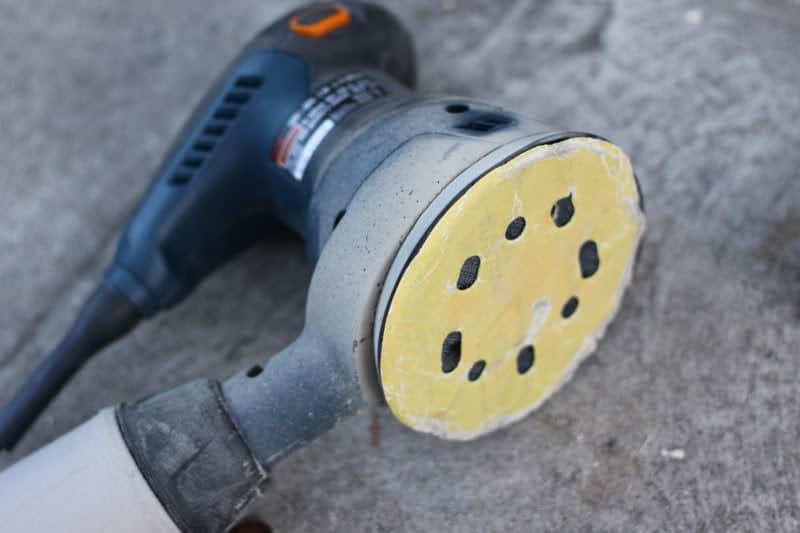 Drill the holes with your 3/4″ drill bit. Bring the two pallets together and insert the 3/4″ bolts. Now your pallets are attached to each other right down the center. Now it’s time to attach our casters, so keep that 3/4″ drill bit out. Place your casters on each corner. I used two static casters on one end, and swivels on the other, which makes it easier to move the bed around. Mark the holes carefully, and drill. Attach your casters with the 3/4″ X 2″ bolts. Secure each bolt with a 3/4″ washer and 3/4″ nut. Tighten with your wrenches. Repeat on all four corners, and put one in the dead center of your bed. Now you have the base of your bed. You’ll want to treat it for outdoors so it doesn’t rot on you. You actually should probably do this before you attach the casters, but I did it after and it was fine. I coated it in several coats of polyurethane, letting it dry between coats. But as I said before, I realized this was too wide for my patio, so…. I had to use a circular saw to chop it down to size, remove the two back casters, and reattach them. I also had to remove the center caster and reattach, so the bed would stay balanced. This also required adding some wood to the base of the pallets in the right spot to attach the casters too. Kind of a pain, which is why I suggested doing this first. Measure twice, cut once, right? Ah well. Now I wanted arms on my daybed. Originally I had thought I would use garden trellis and then place a pot of bougainvillea and have it grow to cover. But no matter how I braced or rigged it, it wasn’t sturdy enough. And also it just looked weird, I realized I probably wouldn’t want to sleep with bougainvillea in my ears and such. So I took that off and went to plan B. Pipe and flange! This worked out perfectly. One thing to consider when deciding what lengths of pipe to purchase is the thickness of your mattress. I went with a thick mattress (10″) so the final height of the bed base would be 18″, a standard seating height (4″ casters + 4″ for the thickness of the pallet + 10″ for the mattress thickness). Then I knew I would add bolsters at the sides, so I went with 12″ pipes for the sides of the arms to support the bolsters. For the cross piece, you’ll need to look at your pallet and where the wood hits. With the placement of the wood slats on my pallet, 22″ pipes worked best for the cross pieces. So I purchased four 12″ pipes, two 22″ pipes, 4 flanges, and four corner pieces, making sure all of the female/male connecters would fit properly. I also purchased 16 wood screws to attach the flange to the pallets. Firs things first, I cleaned the pipe with a good grease-cutting cleaner (dawn dish soap works like a charm to cut grease). Then I went ahead and assembled each arm by attaching the two 12″ pipes to the flange, attaching the corner pieces, then screwing the 22″ pipe across. Then I simply screwed them into the pallets on each 40″ side. The bolsters are supported by the arms, and now my kid and I have a comfy place to lay our heads. The key to a comfy daybed isn’t a fancy frame, in my opinion, it’s pillows. Lots of ’em. And some shade. Learn How to Make A Simple Canvas Awning here. So all in all, the pallet base cost $56 (for pallets and casters), and the arms another $30. So here is my $86 DIY pallet daybed frame. I also purchased this memory foam mattress and a waterproof bedbug-protecting cover for it to keep it nice and clean. I used my Membership Rewards points for a gift card to West Elm, where I purchased linen bolsters and a daybed cover in white, then dyed them. I topped it off with some purchased pillows and some hand sewn pillows. And that’s that. I can’t even tell you how much joy having an outdoor bed has brought to our family this summer. We entertain friends on it as a couch, and we take naps with our kid outside. If you have the inkling to try, I say go for it. It was a very simple project that even a non-woodworking expert like me breezed right through. If you do try it, send us a picture! Awesome tutorial, I think even I could handle that. I love the fact that you can nap on it, with your kids, that would be a dream come true for me. Here in Minnesota, you'd likely wake up with mosquito bites from head to toe to show for it, but maybe in a screened in porch? Best part for me was that you dyed your mattress and bolster covers. DUH! I would have never thought of that, would have had to search forever to find the right color. Genius! I love the pipe arms with the pallet frame. What a great idea. very nice! Do you think using pipes along the back would work to support pillows as well? Our porch railing isn't the sturdiest thing in the world and I try to avoid leaning on it whenever possible. I love this so so much! I would like to take a nap now please. that looks amazing! and I know a place to get free pallets…. Color me impressed! I bow down to your crafty-majesty. What a great Idea for a day bed! your porch looks great! Love this idea. Great photo presentation too. Awesome step by step tutorial and easy to follow. Pleasure to browse all the wonderful posts here. What a wonderful idea! This looks like one I don't need to bug the hubby for– I can do it myself! Thanks for the awesome tutorial! Amazing!! I can't wait to hear more about your DIY backyard… I love the window decorations and shade ideas. Perfect for an Arizona gal like myself. love this patio makeover! especially love the bedding color- the perfect peach! what brand and color did you use to dye it? This is amazing! I'm going to try to do this on my own, even though I've never tried something like this before. Question: if you *had* had room to put that third pallet on the back, how would you have gone about doing that? Thanks! awesome tutorial! one question, since you didn't put a back on the sofa and its got wheels, do you have any problems with it sliding forward (despite the brakes) if you lean back on it? This looks amazing! I am definitely going to try this out for a love seat in my living room! If I wanted to add something for back support, do you think it would be best to do it with another pallet, or with some more piping? The place I want it for in the living room doesn't have a wall behind it. Anyways, thanks for all the instructions! You're space looks lovely and your family is very lucky! This is amazing! You are quite resourceful! Just found a pick of your pallet day bed on Pinterest and followed the link here and read through your tutorial for this awesome project and I love, love, love it!!!!! It looks incredible comfy and cozy…perfect for my deck. :o) Going to try this wonderful idea of yours. Thanks so much for sharing. thanks! send us a pic if you make one! Hi, I love this day bed. Very creative use of pallets & pipes. I would like to know more about the coffee table. Did you revamp it? Hello. LOVE this project. You mentioned that you were going to attach a back to this bed but did not due to space. How were you going to do so? I would love to make this but would need a back. I would attach one myself but likely the thing would fall off! I love this idea!! And admire your creativity and your consideration to share with others. I too am concerned about putting a back on the daybed. How would you recommend doing so? Another asked if you would consider using pipes for the back as well? I appreciate your advice. just found this genius tutorial through pinterest!! love easy to follow directions and ideas! looking forward to reading more of your DIY projects and following through with some i just adore!, thank you! Hi I love your pallet idea but I noticed the table and bench that were redesigned with yarn/rope? do you have a post that desribs that or can you? I love it! LOVE LOVE LOVE!! 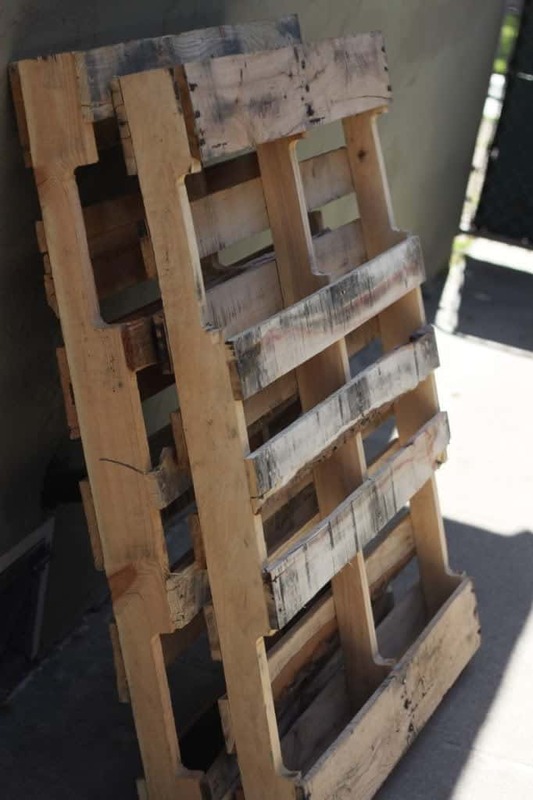 Started looking into making this, even going as far as posting in my local swap group looking for Pallets, until my mother-in-law called laughing because their family bussiness has hundreds.. Dork moment. But got the ball rolling!! I am also intrigued about a back, and if locking the wheels does the trick to not push away from the wall. This is such a great idea! I LOVE re-purposed furniture! I just have one question… in the instructions and supplies needed you mention a 3/4″ drill bit, bolts, nuts and washers… I’m in the hardware business and in the photos they look like a 1/4″ bit, bolts, nuts, and washers… I think that if you used a 3/4″ it would split the wood, is that right? I love this! It’s beautiful and inexpensive–a great combo! do you know how to make the table that you have shown? Oi boa noite achei muito bonito e ecologicamente correto o aproveitamento dos paletis no sofá.E gostaria de te dá os parabéns pela criatividade e por ter compartilhado com todos sua criatividade. great idea…but the pipe arms seem to be rusting away in the outside weather in your pictures..any idea to stop it from rusting? yes. i did not think far enough in advance with that one. but it’s easy enough to avoid, just buy rust-proof pipe. they sell it in every hardware store. sigh. To make it even easier, I would just spray paint the pipes with a rustoleum paint. Should be easy enough. Not sure what rust proof pipes would cost but, spray painting them was the first thing that came to mind. are you worried about the mattress getting wet outside ? what did you use for the fabric? regular sheets? I would use PVC pipe in place of the metal pipe. Then you wouldn’t have to worry about rust. Something you could do to get the rust off of you mattress is whip the pipe with 1/4 in close line rope. This is such a wonderful project for our day room. Might I suggest that you take a sanded 1×6 an use it to face the front of the pallett. you can then paint or varnish it and make a better presentation in the front. this will also stick up above the top of the pallett about an inch which will keep the mattress from moving. This is a georgous project and you have made it very easy to reproduce. Thank you for letting us in on it. It’s been a year and a half since you made this and I was wondering if your bed has withstood the test of time? I am planning on making this for my room as a bed frame, and I hope that it’s durable. We just moved to our new place in the Chilean countryside are into constructing and building our home with recycled materials (totally in love with pallet designs and fruits boxes) and this tutorial is spot on and uncomplicated and the outcome absolutely beautiful!!! Thanks a lot!! is the best I’ve came upon till now. However, what in regards to the bottom line? Are you sure concerning the source? I have discovered this project through another website and I am so happy I run into it. Sometimes it is so amazing what we can do out of ordinary things, such as pallets. I usually use pallets to build firewood sheds, but this daybed it is just a piece of art. Thanks for the inspiration! I ran into your photos of this daybed on Google and I just finished building my own… It’s a bit different but I love it and I’m so happy I can now have guests over for sleeping. 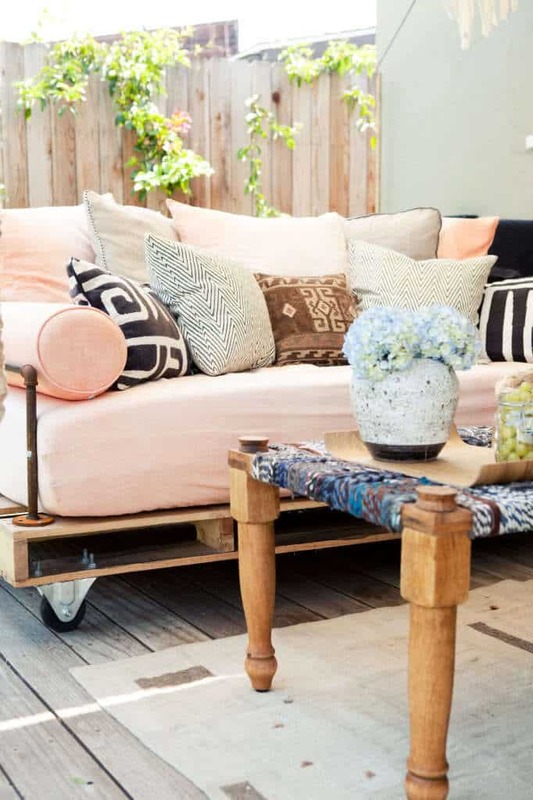 thanks for sharing this pallet daybed. Wow, this is beautiful! I love it and am pinning to my “what to do with a pallet” pin board! I may have to make one of these for my basement family room! and thereafter submits your blogs under the relevant headings. Image ALT Tags – Alt image tags are associated with images on a website. He has to deal with traffic getting back to his office. How do you put a back on it to hold pillows if you are in he middle of a room or only have a screen behind you? This looks like a wonderful idea, but please remember that pallets are not built as furniture. They are made with rough-finished planks that aren’t smooth and sanded, and may have splinters and rusted nails. They’re often thrown or dropped, thus may have broken pieces. In addition, pallets are used and re-used until they’re too broken up to be used again. And you never know what those pallets have transported – it might have been reams of clean printer paper, but could just as well have been drums of toxic chemicals. For the amount of work required to choose and prep the pallets, it might be easier just to build a base from new, clean lumber! be used to build webpages around those targeted phrases. This is really incredible work. I love finding amazing DIYs all across the web, but this seriously just takes the cake. So glad to have come across your blog. I really want to do some DIY with pallets myself, but it will have to wait until I have my own home, or move into a bigger flat! this website, and article is actually fruitful designed for me, keep up posting these content. I’m in the process of gathering supplies right now! So in love with this idea 🙂 2 questions: Where does the 5th caster go? And those look smaller than the 3/4″ bolts that I bought. Are they 3/4″ and will it split the wood? Thank you!!! i don’t think 3/4″ will split the wood. they should work well. I built this using 1/2″ bolts and they worked perfectly. Hi! 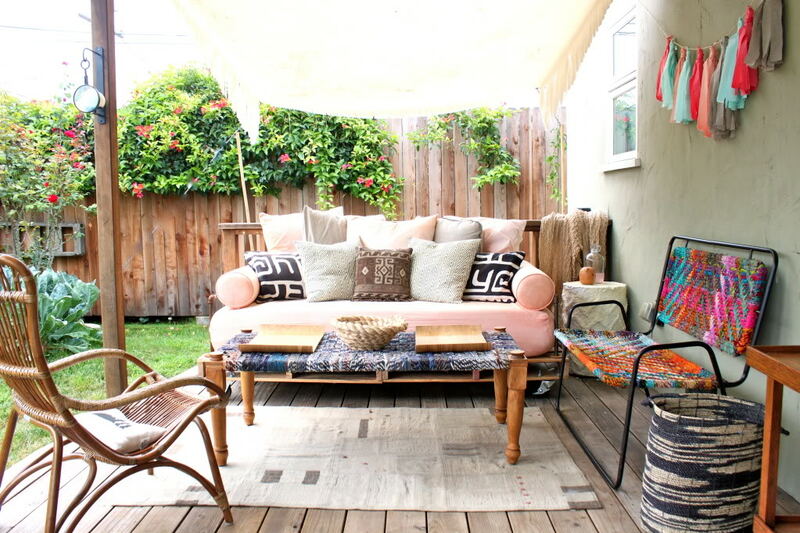 Love this idea, but I’m wondering if you have had any issues with the daybed covers from West Elm not being outdoor fabric? Did you treat them with any kind of product to protect from the elements? I just washed them for a while – my patio is covered and I live in LA where it rarely rains. However, I dyed the cover and the colors did fade. I ended up, after a couple years, sewing a new cover and set of pillows out of weatherproof canvas tarp and that has been great! How many yards of canvas fabric did you need for your mattress? This is such a gorgeous idea, and a very helpful tutorial! I’m planning on making this for the living room in my apartment. Can anyone say frugal uni student? I just have one question–would casters any smaller than 4″ work for this project? Casters smaller than 4″ would leave the couch at an unusual height that may not be comfortable for sitting – then they only other thing to consider is your particular pallets and if the caster base will fit on the available planks. Good luck! I see this post is from 2011. It’s the best tutorial I have seen for making a pallet daybed. Good job! 🙂 Anyway, did you use special outdoor fabric to cover the mattress? I live in Charlotte, NC. It is pretty damp here at night during the Summer so I need something mildew resistant. Thanks for your help! Thank you! yes, we made the first one 🙂 I have since recovered my pallet daybed in fireproof canvas tarp, which you can find on amazon or other online retailers. it is water resistant (it’s used on boats for storage) but less comfy to actually sit on, and a little tougher to sew, but it has been worth it to make it last. the covers in this tutorial were all cotton and they were great, but the color faded in our california sun. the fireproof tarps have been wonderfula nd we don’t have to move anything when it rains. This is elegant, practical and resourceful. Love it. One question – you have not built a back on your day bed. Is that a fence behind it in the photo? I would like to build one but don’t have a fence to lean back on. I LOVE IT !! I wonder if this work out for a bed in the bedroom? I like your table too. Hey, thanks for the influence. I followed the instructions mostly except I nailed down a thin sheet of plywood on top, screwed up 1×6 boards on front and back for better support, and since I was using this as a replacement for my sofa, I stained it espresso, and I didn’t cut the pallets to size, but left it long which made something like 9″ of extra space on each side. It basically looks like a 98″ x 40″ wooden platform with a mattress on top. Yet, I am not quite finished. I might put a wooden back supported by the same pipes used here, and maybe later add two small book cases on each side to square in the mattress. But right now it fits my needs, and it much cheaper with than a sofa or a factory-made daybed, and it quite gives my living room a look of masculine ingenuity and design. Thanks again. That sounds awesome! I would love to see a picture! Dear Jaime – LOVE your pallet bed. Am going to make one for my soon to be bohemian “Florida room” (glassed-in patio). I was purchasing parts yesterday and the 3/4″ bolts & drill bit can’t be right…? That’s as big around as my thumb! In the picture, yours look to be maybe 3/8″ or even 1/4″ – judging by the size of the bit in the drill. Could you please clarify? Thanks a bunch! I was thinking the same thing..they look like 3/8 to me…would you please confirm, Jaime? Very excited to get this project underway! Oh my goodness. It’s been so many years since I made this, but yes I think 3/8 is correct. Thank you! An update to the blog post would be so helpful to people like me (as if it wasn’t so super helpful already!) How has your daybed held up? I hope you’re keeping cool under your canvas awning in this heat wave! I live in Venice and can’t even imagine what it must be like inland! Do you have a tutorial for the coffee table in these pics? Your entire outdoor area looks amazing! Once I have a backyard/patio area, this will be at the top of my DIY list! 1. Make sure to weather/rust proof the pipes as well as the pallets before putting it together. I accidently left it uncovered during a weekend of rain and the pipes all rusted. 2. Use outdoor fabrics/pillows if possible. They are more expensive, but don’t fade in the sun. Also, I had some foam pillows that literally disintegrated after a few weeks of sun exposure. 3. I would suggest building something for the back or using bolsters because just using a ton of pillows didn’t offer enough support and my guests kept falling backwards. 4. I ended up using a thinner mattress and smaller diameter bolster, so I needed to adjust the height of the pipes for the arms. I would suggest picking a mattress and bolsters first and then choosing an appropriate pipe length. I built this a year ago, so the total cost of the materials was significantly higher than 2011 prices. I bought the pallets from downtown LA and I think they were about $12/ea. The cost of the rest of the materials was somewhere around $160 at Home Depot. The mattress and cover was another $130 and the bolsters were about $20 on Amazon. The bolster covers were difficult to find in the large size (forget trying to find outdoor fabric for those) but I found some on Amazon for about $10. (Note: there are large bolsters and covers on West Elm currently, but they are not outdoor pillows, and each bolster + cover will run about $90). All in all, the total cost still came in under $400 and it’s a great homemade, unique piece. I am very happy with how mine turned out. Thank you for the tips! I would love to see a picture! This is such a nice project! I want to do it, but I have one question: did you use any type of fortification in the junction between the two pallets? I’m afraid that simply attaching them with bolts and wrenches wont’t be enough to handle the weight of one big man laying on it. It might give in I guess. I’m thinking about attaching extra battens just in case, but don’t wanna do it if it isn’t necessary. Did yours showed any signs of giving in or is it still sturdy? After abut 4 years it did start to sag – there was also a caster in the middle – so I did reinforce it then. Couldn’t hurt to do it first! I’ve never made anything like your outdoor day bed before but I’d love to try it. I’m on a hunt for back porch ideas and I have to say that yours is absolutely beautiful. Hi, the post seems quite resourceful and I must thank you for the efforts. However, I’m wondering if you could offer some details about the Bathroom of the article, you could explain it more. I would love to get it as I intend to introduce a new hub of information to our website toiletsguide. Thanks!